Okay, so it was actually one week after my one year anniversary of traveling, but that was when the last year really came together in one moment for me. You’ll see why. 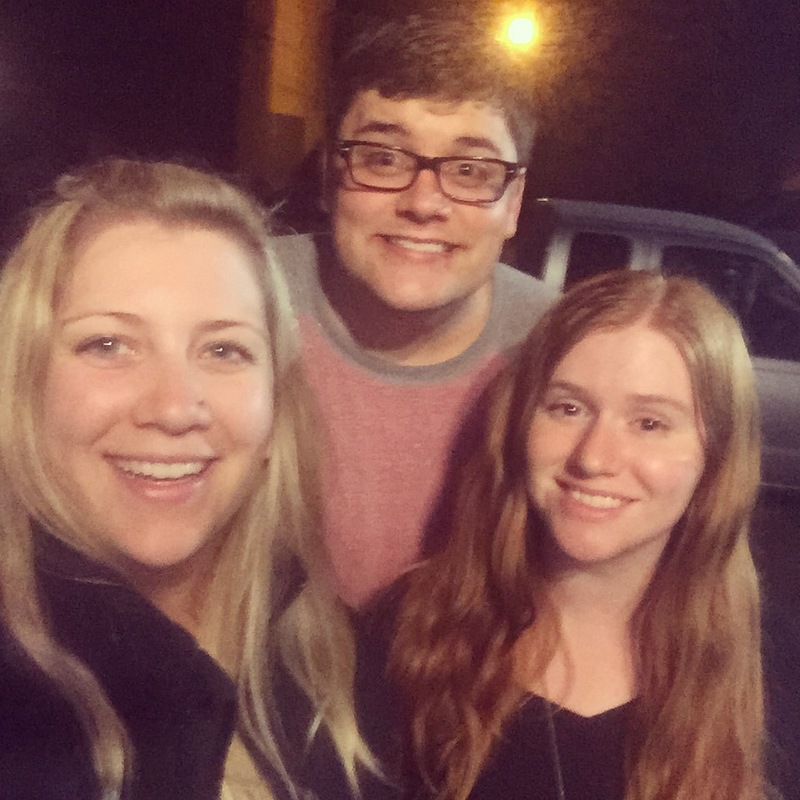 This past weekend some friends came into Seattle to visit me, but not just any friends – friends from Austin! Yes, friends that I met traveling had now traveled to me for a quick vacation. It was so much fun, and reaffirmed for me a lot of reasons why I choose this lifestyle. It’s one thing to meet people you like as you go and hang out with them enough just to get by. But it’s another entirely to make real friendships, ones where you can go months without talking, but when you see each other again you’re laughing together as if no time has passed. That’s how this past weekend went for us. I love having visitors wherever I go because it pushes me to get out and check the must-do kind of touristy activities off my list. 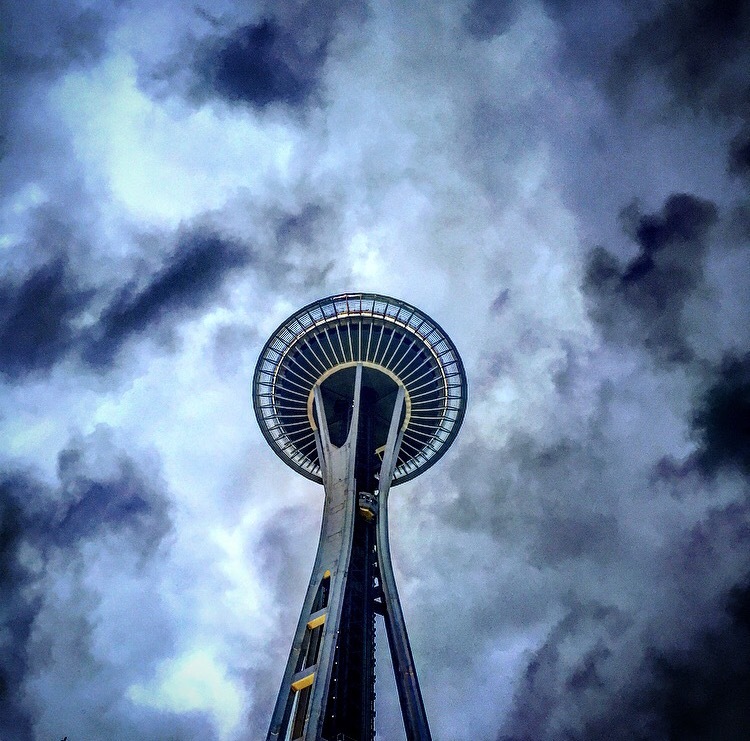 While my Austin buddies were in town, I was able to re-visit my favorite tourist attractions of Seattle – The Chihuly Glass Museum & Gardens and the Space Needle. I also got to spend more time in Fremont, my almost favorite neighborhood in Seattle (second only to Capitol Hill). After a quick drive by the troll, we did some sunbathing in Gas Works Park. I love Gas Works – it has these giant, eerie, rusted old gas tanks and machinery that gave the park its name. It also has a huge hill, the top of which offers a picture-perfect view of downtown Seattle and a great spot to fly kites. We kicked back watching others fly their kites that day, taking in the lovely weather. A quick side-note: Seattle has been surprisingly sunny for pretty much my entire stay here. People who actually live here are concerned, as the cascades show almost no snow on their peaks and temperatures here have reached highs that normally don’t happen until late August. Be aware people – California is only the first state to be (publicly) in a drought. Seattle and the Pacific Northwest have been experiencing unusually hot and dry weather for the past couple of years now, and it’s only been increasing. Okay, back to the weekend. After Fremont, we headed over to Ballard to check out one of the breweries (there are more breweries in Ballard than any other part of Seattle combined). The place we chose was pretty chill, and I finally found a Seattle cider that I enjoy! Number 6 Cider – the perfect choice for those who don’t like hard ciders to be too dry or too sweet. I made a note in my travel journal on that because Seattle is notorious for producing great ciders. From there we ventured further into Ballard to see the salmon ladder, a site I hadn’t actually known about before. It’s right next to where the boats come in from the Pacific Ocean/Puget Sound to head into the fresh water lake. It was pretty cool watching everyone tie up their boats, then the water rising up to meet the level of the lake, then the gate opening so that they could sail through. I was more into the size and grandeur of some of the boats/yachts. My boyfriend and I are really hoping to stay in a house boat during one of our upcoming travel assignments. Anyway, the salmon ladder is a little viewing area underground where you can watch through windows the salmon swimming and jumping from the salt water to the fresh water area. Apparently, they go to the fresh water to nest and lay their eggs, then return to the salt water for hunting and whatever else fish do. There’s a map near the window where you can try to identify the type of salmon you see (King, Sockeye, etc. ), but to me they all looked the same – ugly and delicious. What really struck me this past weekend was a moment I experienced outside of all the sight-seeing. 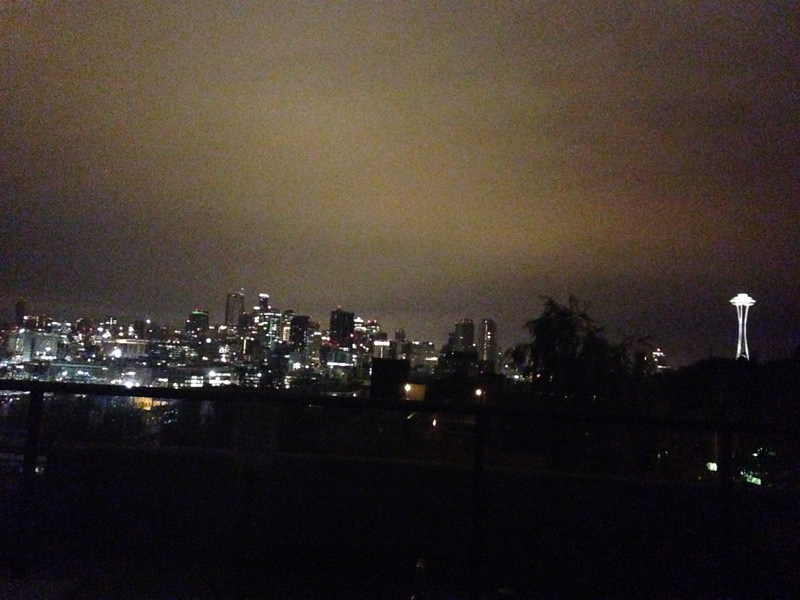 It was my friends’ first night in, and after some light bar hopping in my neighborhood we got invited to a party in West Seattle. 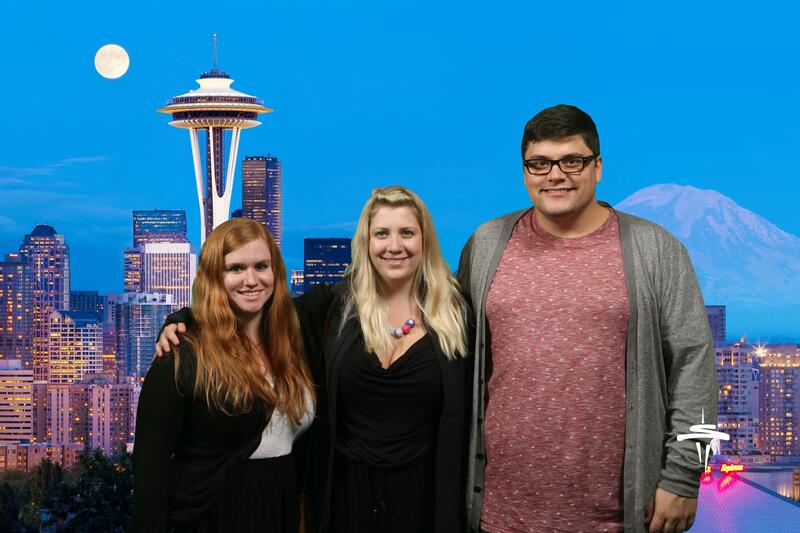 Against all our better judgments (it was late and we definitely needed more sleep than we got), we all headed over and met new people and partied until we found ourselves on a rooftop at 6am, in a hot tub, overlooking the most beautiful view of Seattle I have seen yet. Somewhere in this moment, as I realized the time and looked out at the vast city of lights, the sun just starting to add jeweled colors to the sky, I realized that this was the most New York thing that I had ever done outside of New York. And that was it for me, the moment that tied the whole year together. I was experiencing the rush of adventure and thrill of mystery that I thought I had left behind forever in New York and with my friends. But here I was, at the opposite end of the country in not-New-York with entirely new friends, filling up with a familiar happiness I thought I might never see again. Somehow that moment closed a circle for me, and I have felt a glowing peace within myself since that night. I am everywhere that I have ever been combined with everyone that I have ever met. I am my story and my story is me. I am connected to each new memory I create for myself on this journey, and because of those connections, I am free to be happy. Previous What’s With The Heat Seattle? !